352 x 241 mm. – Two parts in one volume, ff. , CCCXLII; CCCXXII. With 2 borders and 197 woodcut illustrations after Hans Holbein and others, all in contemporary colouring. First edition of this version, edited by Ulrich Zwingli, leader of the Reformation in Switzerland. Full title: Die gantze Bibel der ursprünglichen Ebraischen und Griechischen waarheyt nach, auffs aller treüwlichest verteütschet. This reformed, complete Bible was published in Zurich in 1531, even before Luther finished his translation of the Old Testament into German. The editors fructified Erasmus’ Greek New Testament as well as Luther’s translations and adjusted them to the South German (or Swiss German) language. The remaining texts were translated by theologians from Zurich, foremost Ulrich Zwingli (1484-1531) and Leo Jud (1482-1542). The present vernacular Bible edition forms the centre of the Swiss Reformation and remains today the basis of the ‘Zurich Bible’ currently used by the Swiss Reformed Church in German-speaking cantons. 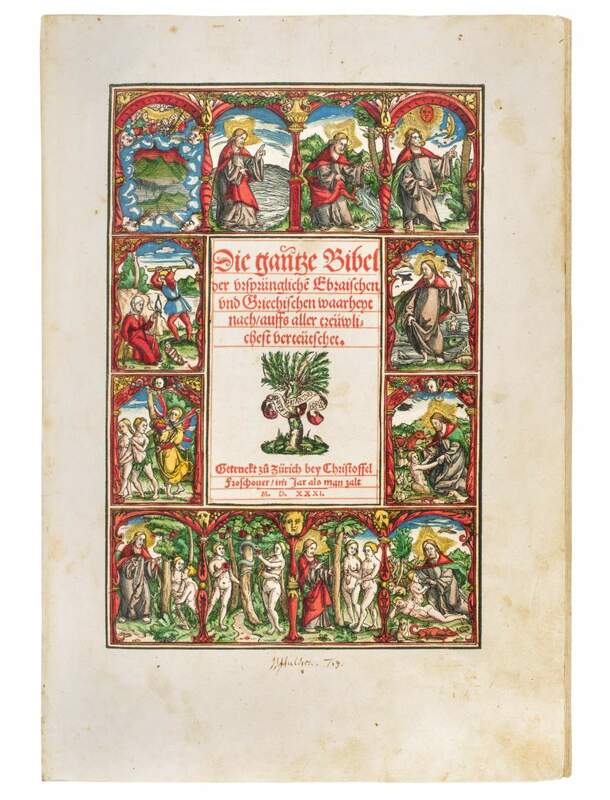 Whereas under Zwingli’s influence images were removed from churches in Zürich from 1523, this Bible is abundantly illustrated with almost 200 woodcuts. Some of the woodcuts had been used before in earlier Bible editions, for example, the 21 illustrations of the Apocalypse by Hans Holbein that had appeared first in 1523 in Basel. The 118 woodcuts in the Old Testament were new, probably executed by Veit Specklin from Strasbourg. At least 69 of these are based on drawings by Holbein. One of the striking features of this copy is the fine and very distinctive colouring. The transparent colour application exquisitely blends into the woodcut structure.